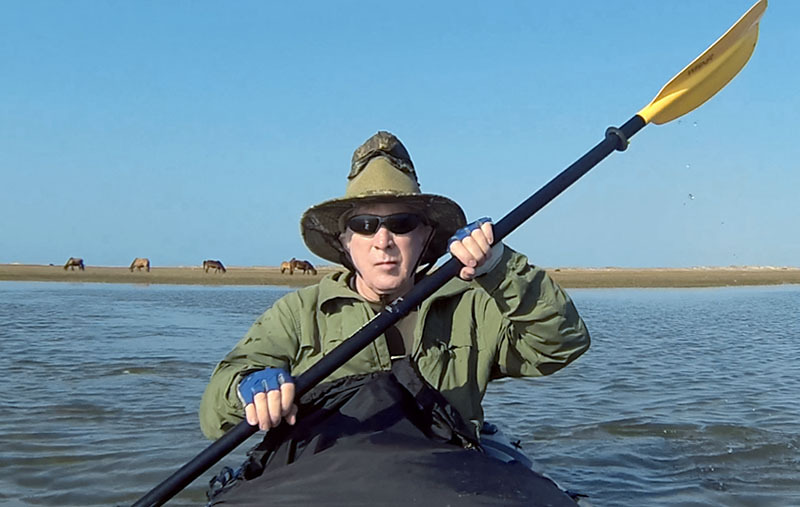 page 2, continuing . . . .
My second day of paddling the tidal marsh at Rachel Carson Estuarine Reserve started as early as the first day. High tide was a little later this day, and it appeared higher too. By the time I reached the inlet off Taylor Creek that leads into the marsh I could tell there were far fewer oyster beds visible above the water. That meant I would have to be even more vigilant of them hidden just beneath the surface, perhaps just far enough the be out of sight, but not so far as to let me pass unscathed. For the second day now the creek and marsh were once again smooth as glass much of the time. Such luck with two days of calm winds for paddling had to be a good omen. 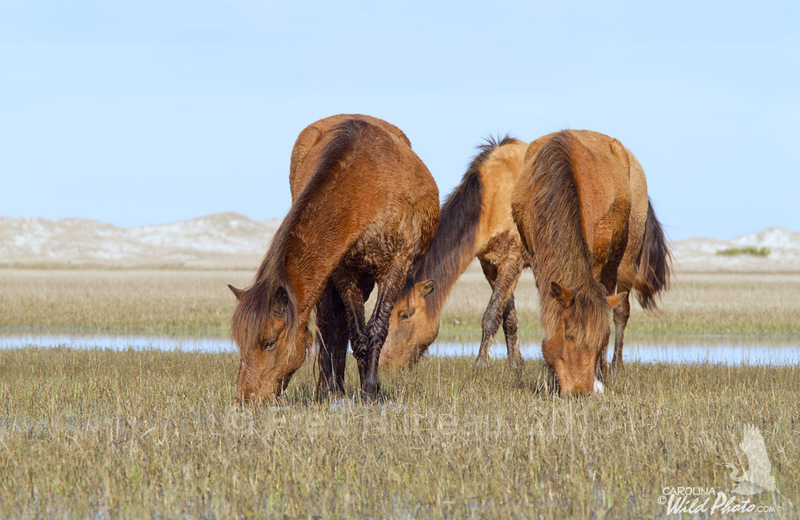 Maybe I would have just as wonderful luck finding the horses out on the marsh. With the water appearing higher, I hoped to have longer to photograph, and an easier time navigating to where I wanted to be for the best angles. As I paddled farther into the marsh I saw almost no oyster beds above water, quite a change from the previous day. Luckily I could see as many horses in the distance on Horse Island as the day before, if not more. The morning light was just right, and I anxiously anticipated a great morning of photography and video. 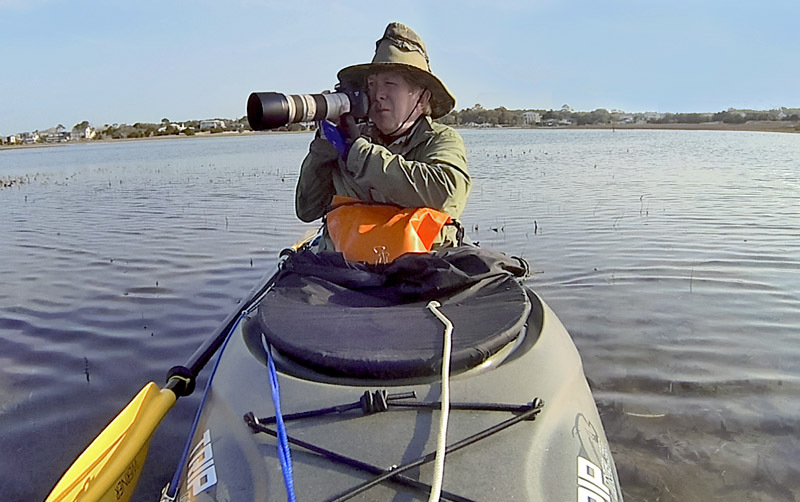 The truth be told, shooting either medium from a kayak is a real challenge. It's far more difficult than it looks. The kayak is never actually still. The lightest breeze will turn you around like a feather floating on water, so keeping the camera pointed at your subject is like taking photos from a merry-go-round. Telephoto lenses only compound the problem. Beaching the bow does help keep every little ripple from jiggling you around, but that's about all you can do to keep the kayak still. In any event, getting these low level shots pretty much requires a kayak (or else a lot of swimming, wading and getting wet). Cameras don't take well to being wet. That means taking extra care in protecting your equipment from water damage, which adds to your preparation time. But in the end, it's worth the effort to get those photos you just can't get any other way. This trip was also my first chance to test my waterproof video camera using the rotating video camera mount I made for the bow of my kayak. I hoped the option to rotate the camera remotely from the cockpit would prove to be a neat trick. My main concern was getting it mounted vertically and level, and learning to tilt it to the optimal height for capturing myself in the kayak, and for scenic views. It turned out I didn't get all of it right, but that was the point - to test and learn for the future. 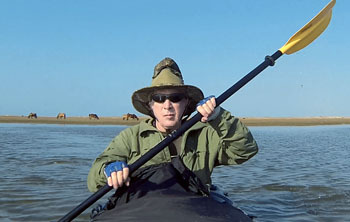 The shots here of me in the kayak were grabbed from the video, which is an option I never had before. With the higher tide this day, I reached Horse Island much more easily, and was able to video and photograph from pretty much any spot I chose. White Ibis seemed plentiful this time, and readily mingled with the horses. I counted seventeen horses, the same as the previous day, which is about half of the total herd on the reserve. 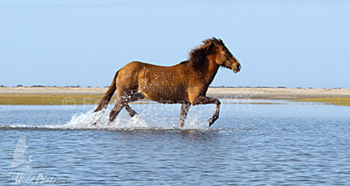 I photographed Willets, American Oyster Catchers, Ibis and sandpipers along with the horses. 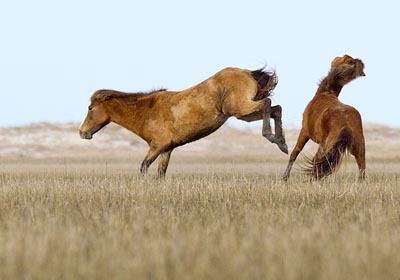 The sandpipers seemed so tiny next to the horses, a context I'd never seen them in before. 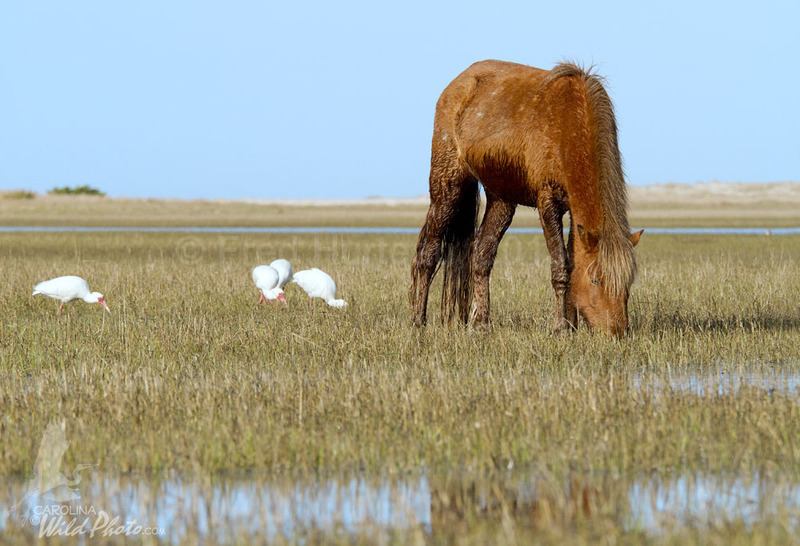 They seem much larger on the beach at the end of a big telephoto lens, but these busy little birds feeding among the horses gave the impression they might get trampled. The ease of paddling around in the deeper water, compared to the previous day, made things all the more pleasant. I was less concerned with getting stranded by the falling tide, though it never left my train of thought. After a couple of hours I decided I had pressed my luck far enough. Reluctantly I put away the camera gear and headed back. It was probably good timing, since at one point I unexpectedly found myself encountering shallow water over a large oyster bed. I had to back-paddle and skirt wide around it, but the rest was easy going. On my way back to the boat launch I thought about the adventure coming for tomorrow. 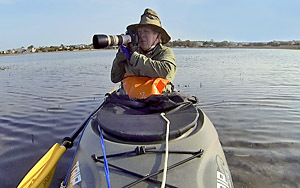 Instead of paddling, I would be boating and hiking with other photographers on Bob Decker's Crystal Coast Wild Horse Photo Safari. I expected to go shooting in places I couldn't readily get to without a boat a bit larger than my little kayak. With the weather promising to continue as beautiful as it had been for my two days of kayaking, this was certainly going to be a trip to remember.